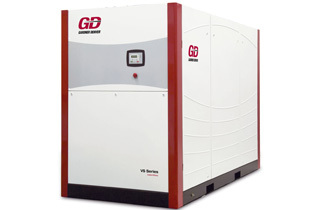 Gardner Denver VS Series: Designed from the ground up as a variable speed solution, the VS Series produces the widest turndown range in the industry. Coupled with the highest efficiency and maximum reliability, the VS Series provides the most flexible solution in the market with unprecedented features and controls. 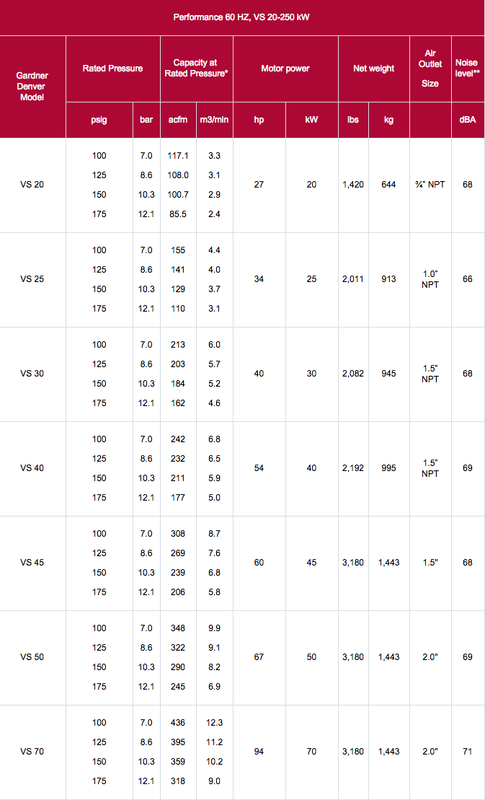 * Capacity measured in accordance with CAGI/PNEUROP acceptance test code PN2CPTC2. ** Noise level measured in accordance with ISO 2151. Variable speed drive designed to maximize efficiency at full, part and no load. Delivers substantial efficiency improvements at part and no load. Airends optimized for variable speed operation and best overall performance. Matched supply side to the demand side at the required target pressure to within +/- 1psi. Unlimited start/stop operation eliminating reservoir compressed air waste. AirSmartTM Controller with variable frequency drive to meet all your variable pressure and flow requirements. Target pressure change by the operator with the touch of a button from 70 to 175psig. 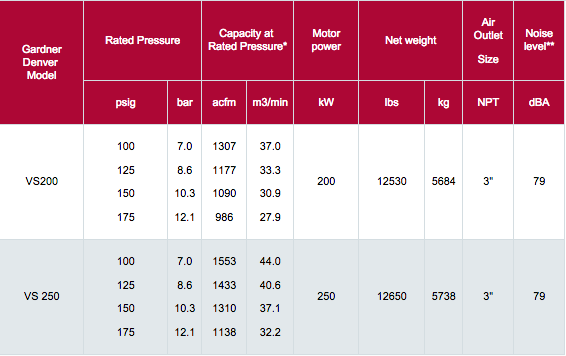 Variable speed control matches the output of the compressor package to the exact requirements of your system demand. Wide turn down range (20% of full load) providing largest operating range to meet all your flow needs. Models from 11kW (15hp) to 250kW (335hp) giving you the widest selection in the industry.